I have just come back from holiday in Spain with my lovely two sprogs ( 4yrs & 10mths) and as usual, i had no idea of what we would need, so packed everything in sight. Below is a list of things I either used every day or made my life easier while we were away. I haven’t added the bare essentials like pram, help/suggestions clothes & sunscreen recommendations as this is personal preference but if you help/suggestions in this area just send me a message and I am happy to help. I am not being paid for any of my suggestions. I have just added links to the actual products I have and know work. 1.Travel Cot Mattress – The bases of travel cots are very hard and the lining included is very thin so I highly suggest you pack a travel cot mattress. Not only does it add an extra layer of comfort but it also helps to keep your baby cool & dry. 2.Kids Float Discs – Much better than the old blow up water wings.I brought 4 discs ( 2 for each arm ) and as the week went on and Harry got more confident we went down to 1 disc per arm. Also no risk of popping or having to blow back up every 2 minutes. 4.Sterilising Tablets – Even though Charley is over 6 months I still sterilised her bottles, dummy, teething toys daily just to be safe. I find the tablets the easiest to use and they are super quick. For any mummy’s wondering how to make bottles up while abroad, I always use bottled water and then boil it. You need to look for a bottled water with less than 200 milligrammes (mg) a litre of sodium (also written as Na) & no more than 250mg a litre of sulphate (also written as SO or SO4). For self-caters just check the bottles at the supermarket & anyone staying at a hotel just e-mails them to check what bottled water they serve. We took Harry to an all-inclusive hotel when he was 3 months old and the hotel actually sourced the bottled water for us and put it in our room every day and no extra cost. 6.Sudocrem – Other brands are available but nothing works like Sudocrem on nappy rash. Even with water nappies & regular changing nappy rash is a given for your baby when you are away. I made a point of letting Charley go nappy-less for a couple of hours a day to try to stop her getting a rash but she still did. Sudocrem is also great on insect bites and for drying out huge holiday spots that take over you face. 7.Pop Up Sun Tent – Wonderful for on the beach to keep the sun off the little ones. Just stick a few toys in it and you have a happily sheltered baby. You do need to weigh the tent down so take a couple of ziplock sandwich bags with you to the beach and fill them with sand and place at the back of the tent. 8.Ipad / Tablet – Now I know none of us admits to our kids watching TV or playing games on the Ipad but trust me some sort of device to entertain them is a must for the plane, hotel room, basically anywhere you go! Download their favourite films or the Cbeebies app is a good one as fun & educational at the same time. 9.Baby Carrier – Makes taking babies & luggage through an airport a breeze. Either put baby into the carrier and get rid of the pushchair at check in or stick wandering toddler in a pushchair while you carry baby & partner takes hand luggage. Also easier when you get off the plane as normally you don’t get your pushchair back until the luggage claim. Mine was brought off e-bay for £10 and is front & back carrying. It happily took the weight of my 4yr old on my back but is recommended for up to 2 yrs old. 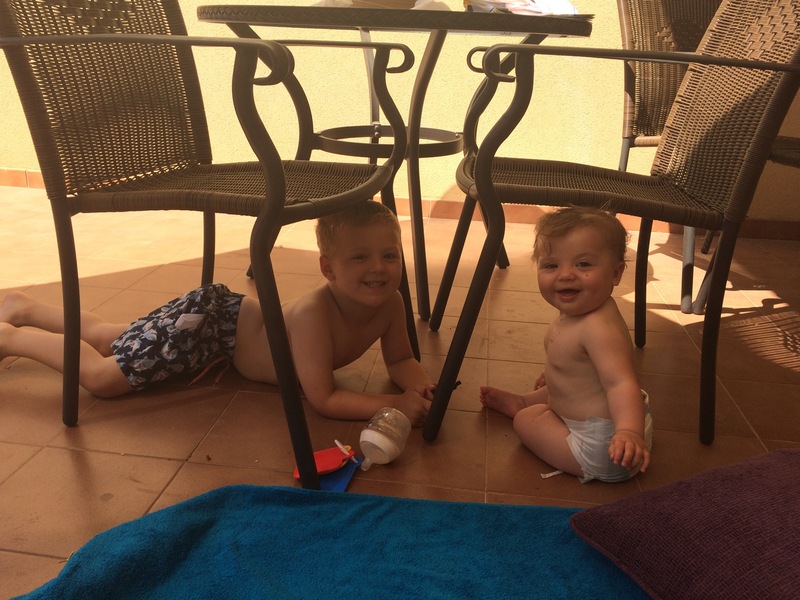 10.Pushchair Sun Shade – With the recent report & findings in regards to putting blankets over your pushchair I would highly recommend a sun shade. We have previously used parasols but they tend to blow out of position with the slightest bit of wind and break easily too.The best advice is to find somewhere shady to put the pram while the child sleeps and point away from the direction of the sun. This isn’t rocket science but so’s not putting a thick towel over a pram and plenty of people have done it. I hope these little suggestions help make life easier. If you have liked today’s blog please can you leave me a little comment below. travel cot mattress – a life saver here when we went away! thanks for joining #fortheloveofblog this week! hope you can join next week! Boots top is great. Thanks! These are some really fantastic and thoughtful essentials that you have mentioned. Will be keeping these in mind on the next trip. Thanks for sharing!